it is possible but difficult to be moral without reminders from religion. Faith is important because it makes the world a better place, by encouraging love and moral behavior. Scientific findings trouble us at times but do not reduce our faith, because science helps us to understand God's creation. The universe which we observe was created under divine guidance, but using natural physics. Every day, the newspapers bring reports of crimes, natural disasters and disease. We feel sadness but accept that both the good and the bad of life are somehow part of God's plan. Evil is present in the world because it is impossible to have free will without evil. The Bible is divinely inspired and mostly true. Regarding the formal teachings of specific denominations, we accept some of what our faith teaches but also reject some. If you select these and similar answers, you are a "Questioning Believer" - You have doubts about the particulars but not the Big Stuff. Evangelical Christians are part of a movement that has never been so powerful or so large. However, at a time of heightened power, old fissures are widening, and new theological and political splits are developing. Evangelical leaders in the United States have clashed recently over a range of issues, including whether the movement should get involved in the debates over global warming and immigration. Evangelicals can now be separated into three camps: traditionalist, centrist and modernist. The traditionalists are characterized by high affinity for orthodox religious beliefs. They have little inclination to adapt to a changing world, and they closely resemblance what has been labeled the Christian right. Visible spokesmen of this camp are the Reverend Jerry Falwell and the television evangelist Pat Robertson, host of the daily show "700 Club" which can now be seen in Europe as well. 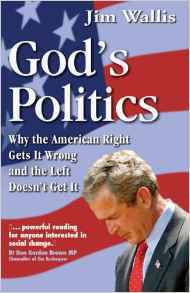 "God's Politics - Why the Right Gets It Wrong and the Left Doesn't Get It." Archbishop Desmond Tutu wrote about Jim Wallis: "He is compelling, provocative and inspirational, with the kind of faith that can certainly move people and communities." The traditionalist and centrist segments of the Evangelical movement are approximately of the same size. Each of these two camps accounts for at least 40% of all evangelists. By contrast, modernist evangelicals are a minority. As you have probably guessed by new, this website is strongly in favor of modernist Evangelism. We intend to update the content of this Website in the near future. Until then, you can find a few links to other Christian Websites at the bottom of this page. This Website originates in the United Kingdom.